The TJ5K takes place annually in Lawrence, Kansas on the 3rd Saturday in November. The TJ5K was initiated in 2013 in memory and celebration of the life of Thomas John Giffin, who passed away at 21 months of age from undetermined causes. Thomas was found unresponsive in his bed on the morning of December 12, 2012, and efforts to revive him by his father, Robby, and emergency personnel were unsuccessful. Thomas’s love for balls of all kinds and the family’s love for baseball prompted the theme for the race. The TJ5K logo was designed with Thomas and the Giffin family’s love for sports, especially baseball, in mind. It’s shape is reminiscent of a baseball diamond and the stripes, 21 for each month of Thomas’s life, resemble those on a classic baseball uniform. The blue and red colors represent the family’s two favorite sports teams…the Kansas Jayhawks and the St. Louis Cardinals. Thomas almost always had a sports ball in his hands, and for that reason, four favorites are placed in the logo. In addition, they signify the levels of support for the TJ5K and Family Fun Run. All proceeds from this event will go to tiny-k, the leading provider of early intervention services. The trail is a grass course winding through a beautiful rural setting. It includes a flat running surface as well as a gradual incline, making the second half of the course more challenging than the first. The 1-mile course winds inside the 5k trail. A pond is part of the pastoral setting one will see. This is a great course for beginning runners or those who want to enjoy a relaxing walk in a beautiful setting. It is a great trail for family participation. The “tiny-k” has a course all its own and is fun for the kids. You will find parents and grandparents watching and cheering on their little runners. Who could resist? Awesome goody bags and medals await each participant. 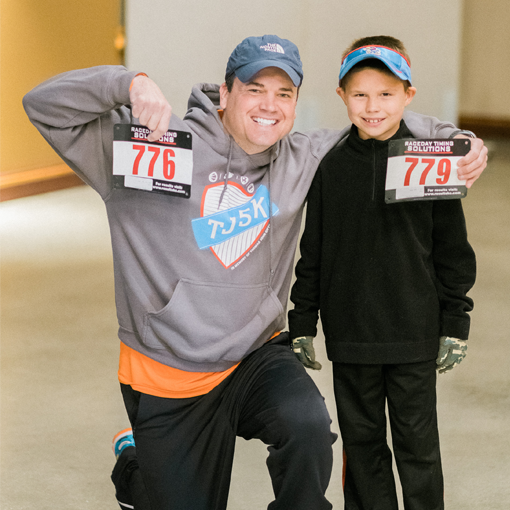 Click the links below to view and purchase images from the past TJ5K Races.